If you’ve been reading this blog for awhile, you know that we like beer. We’ve drank our fair share of Efes and occasionally Tuborg while living in Istanbul. We were thrilled when proper ales showed up on the scene at Bosphorus Brewing Co. last year. Now, since we’re living in Eastern Europe, we’re getting to taste all kinds of different beers – lagers, pilsners, ciders, stouts and even fruit-flavored ones (not a fan). 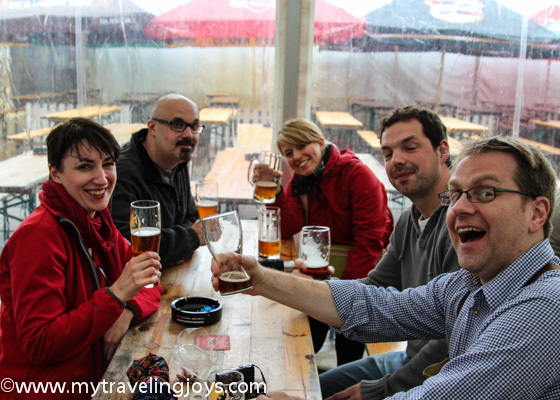 Earlier this month, we traveled to cold and rainy Prague to meet our friends from Germany (a few of the same ones from our Zürich wine trip) and attend the 2013 Czech Beer Festival. The rowdy group of eight of us drank more than our fair share, and I detoxed for a week afterwards. The Americans, Germans and a Swede all at one table at the 2013 Czech Beer Festival. 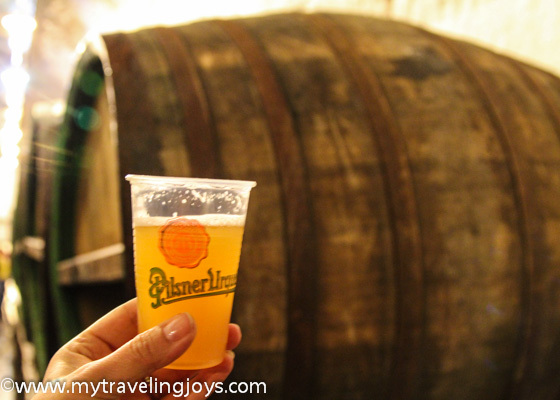 Since we’ve all toured Prague’s historic tourist sites before, we also took a day trip out to the Pilsner Urquell Brewery in Pilsen (Plzen), about a 90 minute drive away via a hired mini-bus with Bohemian Shuttles. 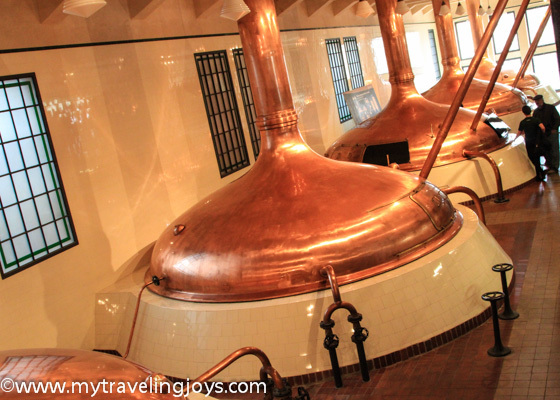 The brewery offers several tours throughout the day in English, Czech and German and gives you a chance to see this popular green-bottled beer up-close at the source. 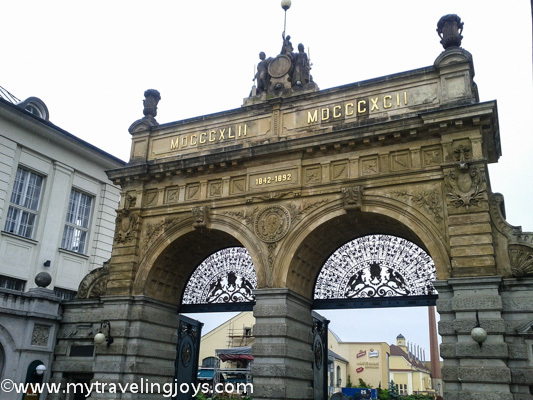 The Pilsner Urquell Brewery, established in 1842, was built along the Radbuza River and operated by several of Plzen’s independent brewers. The master brewer, Josef Groll of Bavaria, introduced the production of bottom-fermented beer with yeast instead of the traditional top-fermented beer. Before too long, other brewers started copying the new golden-colored pilsner-style beer; and in 1859, the brewery registered the “Pilsner Beer” trademark. 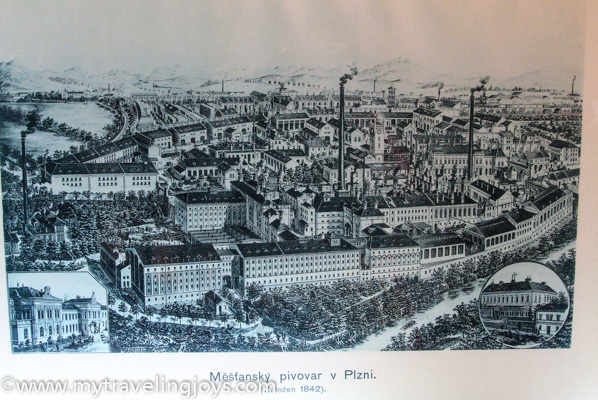 A historical illustration of the Pilsner Urquell Brewery in 1842. Today, the Pilsner Urquell name is part of the SAB Miller global brand, which also owns Blue Moon, Coors Light, Gambrinus, Miller Lite, Peroni and Tyskie (a Polish beer). We learned much about the brewery’s history during our 2-hour tour that took us from the bottling and production facilities through the old and the modern brewhouse and to the historic underground brewery cellars where we tasted unfiltered and unpasteurized Pilsner Urquell on tap straight from an oak lager barrel. It doesn’t get any better than this malty, champagne-colored beer! Good thing we were wearing coats because during the cellar tour, we saw ice crystals on the ceiling overhead, and I was still cold! 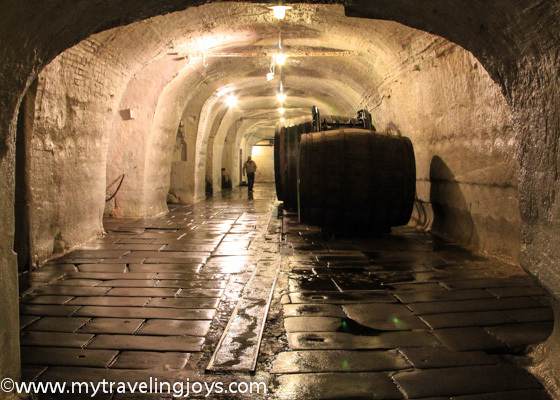 For more than 100 years, the beer was even stored in the cellars with ice blocks cut out from the nearby river to maintain a proper temperature. 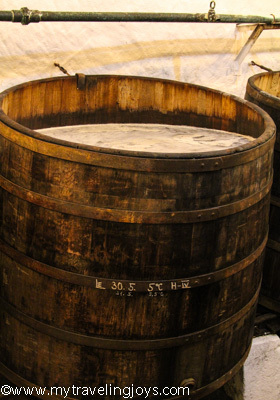 The brewery had up to six-miles worth of underground tunnels at one point for beer storage. 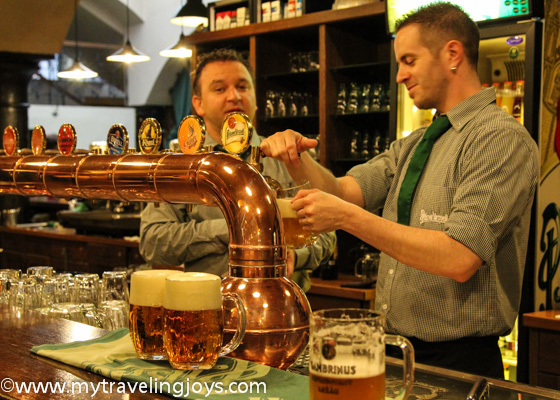 After the tour, we were starving and stopped for a hearty Czech lunch and more beer at the brewery’s restaurant/pub, Na Spilce, which now occupies a portion of the traditional sandstone cellars under the brewery. 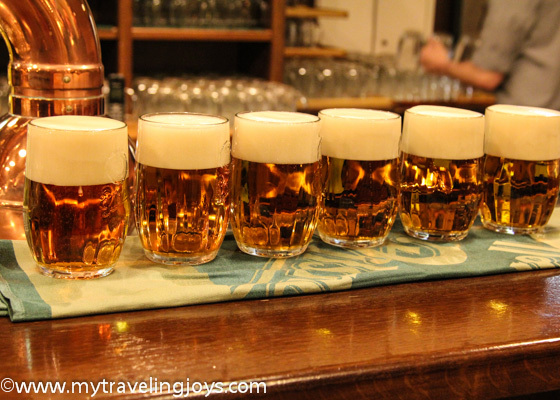 If you like beer like we do, be sure to check out the Pilsner Urquell Brewery tour while you are visiting the Czech Republic. English tours are at 12:45, 14:15 and 16:15. Please check the brewery’s site for specific times and changes here. 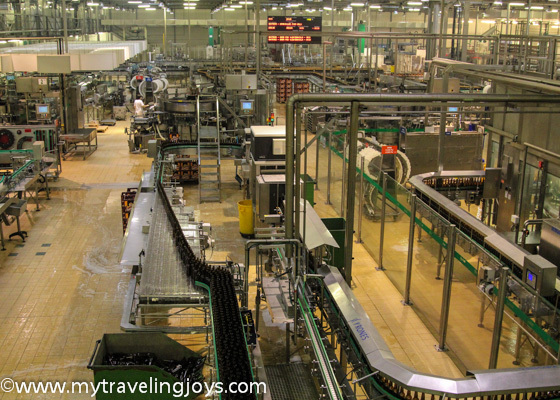 The brewery's production line processes 120,000 bottles per hour! 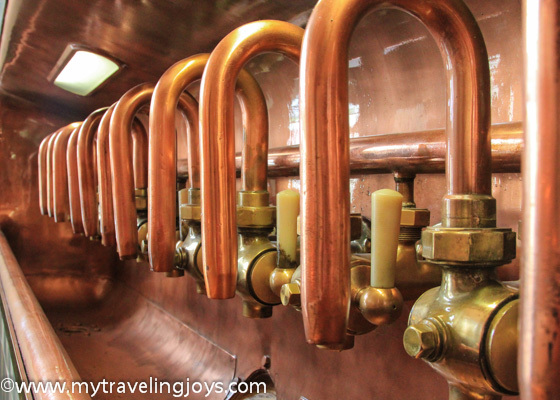 The historic copper holding tanks in the old brewhouse. The fermenting stage in old oak barrels. oh what fun. i am not a beer drinker but my husband loves it. Was there Aug '12. Awesome time! I spent some money at the Pilsner Urquell gift shop. Pilzen was a great city! The PUB was a cool bar as well. @Jason, Yes, Pilzen definitely is a great place to visit! Thanks for stopping by! Pilsner Urquell is the nectar of the Gods!